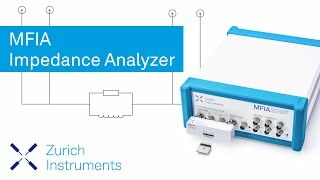 Zurich Instruments offers powerful tools for all types of impedance measurements. Whether you need a high-accuracy impedance analyzer, or a high-speed multi-frequency impedance spectroscope, we have the right instrument for you. The MFIA is a digital impedance analyzer and precision LCR meter that sets the new standard for impedance measurements in the frequency range from 1 mHz to 5 MHz. The MFIA provides 0.05% basic accuracy and a measurement range spanning from 1 mΩ to 1 TΩ. The instrument has a high measurement repeatability and a small temperature drift. 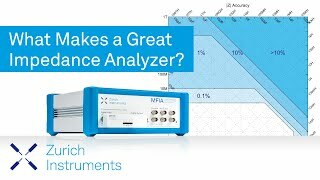 With the LabOne® user interface the MFIA offers a number of long-awaited innovations for the impedance and LCR measurement available without the need of any software installation. Go to the product page and get in touch to discuss your application. What makes a great Impedance Analyzer?